After hiking one hour in the sweltering heat in the rural mountains of Honduras, our guide opened the gate and led us into a small mud-brick house. Our guide was the grandson of an eighty-one-year-old male resident of Guachipilincito. We were on a 'home visit' to see "a gentleman who is unable to walk to the clinic due to leg pain". We found him lying on a straw mat on the dirt floor outside his home that he shares with his wife, 4 children, and 6 grandchildren. He said the symptoms began two years ago with lower extremity weakness, requiring a walker in the beginning; he is now unable to move from the floor without the assistance of his family. He has spent his days and nights on this mat over the last year. We spoke with him and his family in detail and performed a full physical exam only to discover he had upper and lower motor neuron findings with no strength in his lower extremities. In spite of that, he had a smile on his beautiful face and his family huddled around him with love, respect, and understanding. As we delivered the news that he would not be able to walk again, the expressions did not change. They explained that they have seen these things in their community before and they are not worried as "God will do what he needs". During the week brigade, we were able to see almost 500 patients in the clinic we created at the local elementary school house. We were also able to see another 100 people during home and outreach visits. We provided general medical care for conditions such as gastritis, headaches, dehydration, pneumonia, UTI, anemia, goiter, and malnutrition as well as complicated conditions such as thyrotoxicosis, 3rd degree burns, delirium, and a parotid tumor. 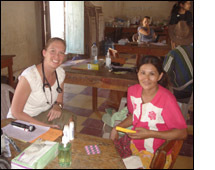 We had limited resources but were able to provide basic medical care. More importantly, we established ourselves in the community and developed relationships to foster. I have never been so immersed in a local culture and its' people. I was fortunate enough to share time with patients and families in their homes as well as the clinic. This experience brings a whole new meaning to the term "access to care". I want to thank the Benjamin Josephson Fund again for this extraordinary opportunity.